Book by Jul. 31, 2019 to receive a $500 Air Credit per person on the Oct. 5 and 12, 2019 departures. Prices online do not show the discounted rates. Terms and Conditions apply, special offer is subject to availability, please contact us for more details. Discover the powerful wilderness and warm charm of the Pacific Northwest over a wide-ranging week in the San Juan Islands and British Columbia. You’ll venture to spectacular, remote islands and sail through channels that teem with sea life, plus you’ll visit charming towns and First Nations heritage sites. This National Geographic Sea Bird voyage sails one-way between Seattle and Vancouver allowing ample time to venture far north into Alert Bay, including Victoria and the Robert Bateman Centre, with remote stops in the San Juan and Gulf Islands, and deep in the fjords of British Columbia. Discover the Wildness of the San Juans & British Columbia Sail among the more remote San Juan Islands in places ideal for kayaking, exploring by expedition landing craft, and hiking where seals, sea lions, river otters, bald eagles, and killer whales are often seen. Venture to the Gulf Islands, a rich archipelago in the Strait of Georgia, perfect for active exploration and rich in wildlife. Go through Desolation Sound, on the north end of British Columbia’s Sunshine Coast, a mecca for kayakers with its calm, sheltered waters and outstanding natural beauty. Explore its isolated bays and islets by kayak and then hike its meadows and lush green forest trails. First Nation Cultures of the Region In Alert Bay you’ll make your way to the U'Mista Cultural Center, home to a stunning collection of potlatch masks created by the Kwakwaka'wakw peoples. In the Big House see the Tsasala Cultural Group bring the stories of their people to life through a powerful dance ceremony. Visit charming towns & museums Enjoy a guided tour of Friday Harbor’s Whale Museum, with its fascinating collection of artifacts, artwork, and whale skeletons. Or choose to walk the picturesque town’s streets, mixing with locals in the art galleries, coffee shops, or pubs. And in Victoria, there’ll be a chance to tour private gardens, take a bike ride and call at the Robert Bateman Centre to take in the definitive collection of his incredible natural history artwork. Travel in excellent company Explore under the sure guidance of an expedition leader, a historian, a geologist/naturalist, plus a National Geographic certified photo instructor and a wellness specialist. Their knowledge and passion for British Columbia & the San Juan Islands is the key to your once-in-a-lifetime experience. 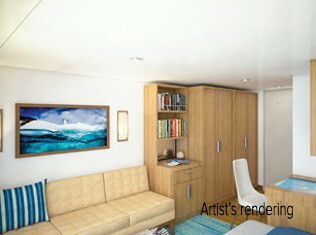 Cat 1 #301-306 Cabins feature two lower single beds that can convert to a Queen, a writing desk and two portholes. Each cabin has individual climate controls, allowing you to adjust the temperature to your liking. Botanically-inspired shampoo, shower gel, and lotion are all available in cabin bathrooms, as well as an Expedition Essential Kit. Hair dryers are also available in each cabin. 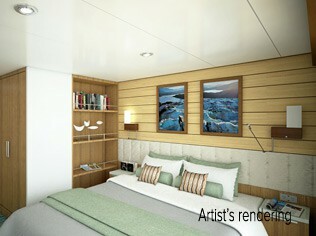 Cat 2 #307-315 Cabins feature two lower single beds that can convert to a Queen, a writing desk and two portholes. Each cabin has individual climate controls, allowing you to adjust the temperature to your liking. Botanically-inspired shampoo, shower gel, and lotion are all available in cabin bathrooms, as well as an Expedition Essential Kit. Hair dryers are also available in each cabin. 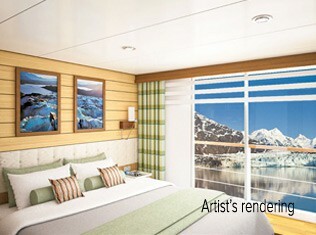 Cat 3 #201-206 Cabins feature two lower single beds that can convert to a Queen, a writing desk and a large view window. Each cabin has individual climate controls, allowing you to adjust the temperature to your liking. Botanically-inspired shampoo, shower gel, and lotion are all available in cabin bathrooms, as well as an Expedition Essential Kit. Hair dryers are also available in each cabin. Cat 4 #207-229 Cabins feature two lower single beds that can convert to a Queen, a writing desk, sliding glass door and small, private balcony. Each cabin has individual climate controls, allowing you to adjust the temperature to your liking. Botanically-inspired shampoo, shower gel, and lotion are all available in cabin bathrooms, as well as an Expedition Essential Kit. Hair dryers are also available in each cabin. Observation Deck #101-108 (Suite) Cabins feature two lower single beds that can convert to a Queen, large view windows, an expanded bathroom, writing desk, ample storage space, and a convertible sofa bed to accommodate a third person. Each cabin has individual climate controls, allowing you to adjust the temperature to your liking. Botanically-inspired shampoo, shower gel, and lotion are all available in cabin bathrooms, as well as an Expedition Essential Kit. Hair dryers are also available in each cabin. Arrive in Seattle and transfer to National Geographic Sea Bird to begin your expedition. Today we’ll visit the more remote of the San Juan Islands, an archipelago in northern Washington State perfect for kayaking, exploring by expedition landing craft, and hiking. Search for seals, sea lions, river otters, bald eagles, and other marine mammals. Explore Friday Harbor, a picturesque town on San Juan Island. Visit the Whale Museum, with its fascinating collection of artifacts, artwork, and whale skeletons. Stop in at small shops and galleries. Later, we’ll search for killer whales on our way to British Columbia. Wake this morning among the Gulf Islands, a rich archipelago in the Strait of Georgia, and a yachter’s paradise. We’ll take our pick of perfect spots to kayak, hike, and search for wildlife. 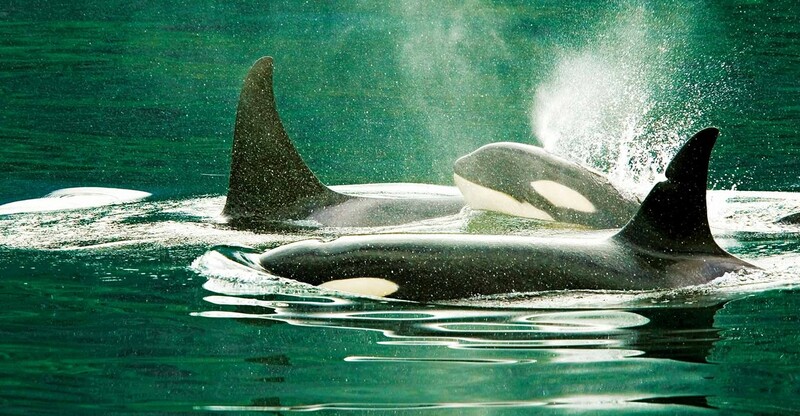 Sail through Johnstone Strait, one of the foremost viewing areas for killer whales in the northern hemisphere. In the afternoon, we’ll land in Alert Bay and make our way to the U'Mista Cultural Centre, home to a stunning collection of potlatch masks created by the Kwakwaka'wakw peoples. We’ll then walk or ride to the Big House, just a short distance away where the Tsasala Cultural Group puts on a dance and the performers explain the story of the dance movements. Vessel Type: Expedition Ship Passenger Capacity: 100 Built: 2017 National Geographic Venture is the perfect ship to explore Alaska’s Inside Passage and beyond. Cabins & Suites The luxury of comfort on expedition National Geographic Venture comfortably accommodates 100 guests in 50 outside-facing cabins. Cabins are efficiently designed, with sizes range from the 136-square-foot category 1 to the 185-square-foot category 5 suite. Twenty-two of the 50 cabins will feature small balconies with floor-to-ceiling sliding doors that bring in the spectacular views and ample natural light. Twelve cabins will connect via internal doorway access allowing families to combine their rooms. 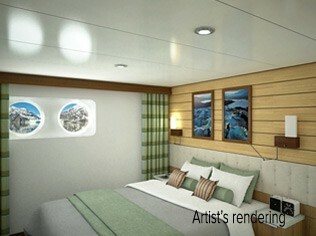 Plus, all category 5 suite cabins can accommodate a third person on a convertible sofa bed. Comfort & convenience in every room Every cabin has two portholes, a large window or balcony, Wi-Fi access, and temperature controls. Bathrooms are modern and stocked with botanically inspired hair products, soap, and shower gel, plus a hairdryer. Every room has outlets and USB outlets for charging your camera gear or electronics, and space for luggage storage. Life Aboard Dining Food served aboard is fresh, local, and delicious, and sourced from suppliers who share our values of sustainable use whenever possible. Meals aboard are almost always served in the dining room, located aft of the lounge deck. When weather conditions allow, lighter fare may be served on the observation deck. There is no assigned seating and our dining room accommodates the entire expedition community in a single seating. During meals your expedition leader, naturalists, and any guest speakers aboard will join you. Public spaces National Geographic Venture was designed with 50 years of expedition heritage. The ship features a specially-designed, open bow and an observation deck for gathering to watch for wildlife or enjoy an evening cocktail with friends in the open air. An elevator access all decks, and public restrooms are available on every deck. Bridge: You’re invited to the ship’s bridge to see the calm business of navigation unfold. Ask the watch officer Ventureions about navigation. Or, help yourself to the ever-ready binoculars to scan the horizon for whale spouts. There may occasionally be times when the bridge must be restricted to shipboard personnel only. Lounge: The lounge is the heart of our expedition community, where we hold cocktail hour and Recap each evening. It’s also where you’ll gather for presentations, photography talks, and guest speaker presentations. Seating design takes advantage of the wraparound windows for an optimal view, and boasts multiple high-definition screens for slideshows and videos. Forward lounge doors provide direct access to the bow. There’s also a small reference library and board games and cards are also available. Bar: The bar is typically open from 11 a.m. until one hour after lunch begins and from 5 p.m. until closing. A variety of beverages are available for purchase including wine by the glass or bottle, cocktails, specialty drinks, and spirits. There is also a 24-hour self-service beverage station with coffee, tea, soft drinks, beer, water, ice, and snacks. The drinking age aboard the ship is 21. Sundeck: Morning stretch classes are held in the open air of the sundeck, located aft on the observation deck. After stretch class the deck is set with tables and chairs, and lounge chairs. Bow: National Geographic Venture’s specially-designed bow observation area accommodates the entire expedition community at once for a shared wildlife viewing experience. Mud room: Located aft on the main deck where you will embark and disembark expedition landing craft, the mud room has lockers that provide convenient gear and boot storage. Wellness aboard Making daily discoveries and exploring the wild world is naturally uplifting. 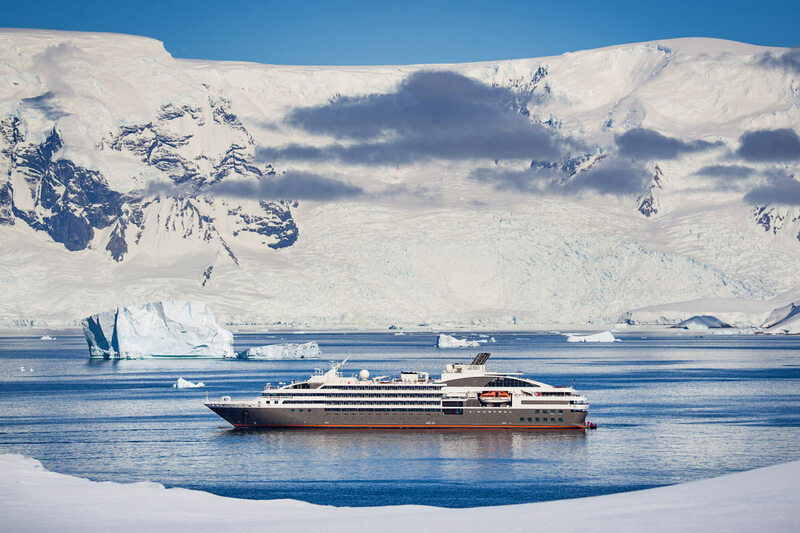 Add to that a variety of wellness treatments available aboard, as well as outings led by your wellness specialist, and you’ll find your expedition relaxing as well as revitalizing. Massages, body treatments, natural facial treatments, and hand and foot treatments are all available in the LEXspa. You will have the opportunity to sign up for a treatment once on board. Fitness Center: Conveniently located on the lounge deck, the fitness center is outfitted with two treadmills, exercise bikes, elliptical machines, exercise bands, and sets of small hand weights to use as well. The global gallery: a window on regional talent Discover the talent of local artisans in the places National Geographic Venture ventures in the ship’s global market. The global market is a collection of items made by local residents in the places we explore. It is conveniently located on the ship’s lounge deck. You may find silver jewelry crafted in Alaska, woven baskets from Panama, paintings and books by your naturalist staff, plus expedition clothing and other essentials. Every item purchased in the global market contributes to the Lindblad Artisan Fund, which supports artisans in communities around the world to develop their potential more effectively and successfully. Five percent of all National Geographic Venture’s global market sales will be earmarked for this fund, and the Lindblad-National Geographic Fund will match dollar for dollar what is raised through these earmarks. Tools for Exploration Expedition Landing Craft Key to our operation is our fleet of expedition landing craft, which we use to land in places that would otherwise be inaccessible. With 8 of these boats and two loading stations used every time we disembark, we’re able to transfer guests off the ship quickly, so you can be out on adventures, not idly waiting. The expedition landing craft we use are 19 feet long, powered by four-stroke outboard engines, and are capable of comfortably carrying 10-12 people. They are widely recognized as the safest and most versatile small boats afloat. Remotely Operated Vehicle Capable of reaching 1,000 feet, far beyond the range of any Scuba diver, the ROV allows you to literally view parts of the undersea that are as unexplored as the moon. Chances are you, like many of our guests, will be struck by how surprisingly colorful undersea life is in these unlikely places. And this glimpse may fundamentally change how you view the ocean. Kayaks National Geographic Venture is equipped with 24 two-person kayaks—a fleet large enough to ensure everyone who wants to can paddle at every opportunity. Consequently, prior kayaking experience isn’t necessary—many of our guests have their first kayaking experience in extraordinary locations. Our custom-designed floating platform lets us deploy kayaks from the ship, or any location we want—including far from shore. Kayakers are usually free to explore where they want within boundaries set by the undersea specialist and officer of the watch. Underwater camera Our undersea specialist will dive often during your expedition, even in Alaska, with cold-water gear, to shoot high-definition, Cousteau-like footage of the deep. Colorful nudibranchs, swimming, plant-like crinoids, and mysterious fish with antifreeze blood that thrive in the frigid sea will give you an entirely new appreciation of the marine environment. Video microscope Naturalists will use the video microscope to help explain all elements of the environment, including tiny organisms that are the building block of the marine ecosystem. Spellbinding live views of krill at 80x magnification fills the high-definition screens in the lounge with vivid detail, and fills every onlooker with a sense of wonder at the importance of otherwise unobservable creatures. Hydrophone This underwater microphone is deployed to listen to the vocalizations of marine mammals. Real time transmissions of their eerie, haunting sounds can be broadcast through the ship or recorded for later playback. Few experiences in nature are as captivating as watching humpback whales feed close to the ship as their vocalizations play through the ship’s PA system. Electronic charts An electronic chart showing the ship’s location, course, and speed is almost always on display in the lounge. Open bridge You’ll find our captains are engaged, knowledgeable members of your expedition who are eager to share their passion with you. Venture’s open bridge features comfortable spaces to sit, enjoy the view, drink your morning coffee, or simply chat with the officers. Snorkeling gear & wetsuits On warm weather itineraries where there will be snorkeling, you’ll select a mask, snorkel, fins, and wetsuit that remain yours for the duration of the expedition. There’s no need to pack and tote your own gear, although guests who prefer to are welcome to bring their own.